We’d love your help. Let us know what’s wrong with this preview of The Enchanted by K.B. Hoyle. To ask other readers questions about The Enchanted, please sign up. I love that question: What did you think? Well, I think that I love this series! Totally THRILLED that I am blessed to be able to read these the second they come into our PH. Okay, what did you think of this bit? UGH! That made me nuts! lololol...and what's funny/good/amazing...is that I agreed with her. This is a JOURNEY with ups and downs and left me wanting to hu I love that question: What did you think? This is a JOURNEY with ups and downs and left me wanting to hug some characters, beat some others and just BE with them. The Six are growing up and they are finding that the life on the other side of the gateway can be harrowing, even more so than in earlier books. Collin...ah, Collin...what ARE you thinking? Tellius...my daughter says that he's grown into someone SHE wouldn't mind marrying! And Darcy, oh Darcy. Did you read the part about me having a 16 y/o? Yeah...Ms. Hoyle GETS kids and how they react...and how they grow. Darcy is growing and I'm quite proud of her. Review originally posted on The Oaken Bookcase on October 18, 2012. I’ve really enjoyed reading this series as each book has been released this year and The Enchanted w Review originally posted on The Oaken Bookcase on October 18, 2012. One day while hiking a young girl discovers a portal to another world, the magical land of Alithia. She soon learns of a prophecy claiming that she and five others are destined to save this mystical place. At first the six are unsure of their part in this ancient prophecy. But eventually they learn to work together as a team, united in their efforts to fulfill their destiny and save this enchanted land. Author K.B. Hoyle pens scenes that pop with vibrant details, making the world of Alitheia vivi One day while hiking a young girl discovers a portal to another world, the magical land of Alithia. She soon learns of a prophecy claiming that she and five others are destined to save this mystical place. At first the six are unsure of their part in this ancient prophecy. But eventually they learn to work together as a team, united in their efforts to fulfill their destiny and save this enchanted land. Author K.B. Hoyle pens scenes that pop with vibrant details, making the world of Alitheia vivid and very much alive for the reader. There are new and exciting twists with the turn of each page as this dynamic series unfolds. Hoyle is a gifted author whose stories flow smoothly from one exciting chapter to the next, leaving the reader heartily anticipating the next adventure. The Gateway Chronicles are a phenomenal and entirely compelling series. As the story progresses all the characters are fleshed out as each grows and develops in maturity. The six encounter struggles to which we can all relate and from which we can all learn. Each book in the series expertly builds upon the last. Hoyle guides her readers through a gauntlet of magic and fantasy adventure as the series builds to a resounding crescendo. The world of fantasy fiction is brought to an entirely new level with this outstanding series. The Gateway Chronicles are destined to become a timeless classic. Darcy is growing up, and it is both thrilling and tragic to watch. This is my favorite in the Gateway Chronicles series, but I felt that way after I read each one of them. They keep getting better, more exciting, more deep into the characters' lives and personalities. A little bit more angsty teen romance in this one, which I totally love. Looking forward to the next, always looking forward to the next. Short Review: The Enchanted is my favorite of the series so far. I finished it up at 5AM this morning after not being able to fall back asleep after being up with a sick kid. Darcy and the rest of The Six are back for their fourth trip to the magical world of Alitheia. Darcy and the rest of the six, as well as Prince Tellius are maturing into their roles. They have started paying attention to the important people in their lives and starting to put their own needs behind what they think is best f Short Review: The Enchanted is my favorite of the series so far. I finished it up at 5AM this morning after not being able to fall back asleep after being up with a sick kid. Darcy and the rest of The Six are back for their fourth trip to the magical world of Alitheia. Darcy and the rest of the six, as well as Prince Tellius are maturing into their roles. They have started paying attention to the important people in their lives and starting to put their own needs behind what they think is best for the other. That does not actually mean they make the right decisions, but the movement is a sign of maturity. This is a story that is more about character development and relationship building than action. There is still action here, but the focus the characters and I think the book shines because of that. I will be impatiently waiting for the next book in the series. Every time I leave Darcy Pennington at the end of a book, I feel like she’s grown and finally becoming less self-centred. But every time I take up with her again in a new book, it’s almost as if she reverts, as if the time spent in Alitheia has been washed away by another year at high school. This book is my favourite so far (and don’t I say that after finishing each book? ), and I think this is the first book that I can really say that I liked Darcy in, but in the beginning she was very irrespon Every time I leave Darcy Pennington at the end of a book, I feel like she’s grown and finally becoming less self-centred. But every time I take up with her again in a new book, it’s almost as if she reverts, as if the time spent in Alitheia has been washed away by another year at high school. This book is my favourite so far (and don’t I say that after finishing each book? ), and I think this is the first book that I can really say that I liked Darcy in, but in the beginning she was very irresponsible and silly. Alitheia is recovering from a war with Tselloch and has changed vastly rom the magical land we were introduced to in The Six. Darcy and her friends also have an increasing familiarity with the land, which is nice because the long story line is beginning to coalesce into something amazing. I loved getting to see a military keep as well as the well-appointed palace, and visiting familiar places but seeing them in a new light. I think The Enchanted expands well on the world and continues to it unfold naturally. One of the things I like about the writing of this series is that the characters are all very realistic: they think, act and react like sixteen year olds which is refreshing (and sometimes annoying, but it’s meant to be!). So when Amelia experiences heart-break and Sam expresses confusion in her relationship with Lewis, I felt strongly right along with them. I felt Darcy’s pain at her rejection as well, but rejoiced that she was finally over Perry (he isn’t very nice, let’s face it). And my, how Tellius has grown. He’s one of my favourite characters now, and I really want to read more about him! The plot of The Enchanted is a lot more character driven than some of the previous volumes, which allows for lots of development. However, I liked how loose threads from the last three books have increased significance in this book, and it was great to finally get some answers and see where Colin lies in all this.I do feel that Darcy should have recognised the importance of her ring a lot sooner, there were so many obvious clues, but as usual she was just a little too self-absorbed and then reacted with undue surprise when everything was made clear. So, another great instalment in The Gateway Chronicles series, which has built brilliantly on the foundations laid down by the previous books. 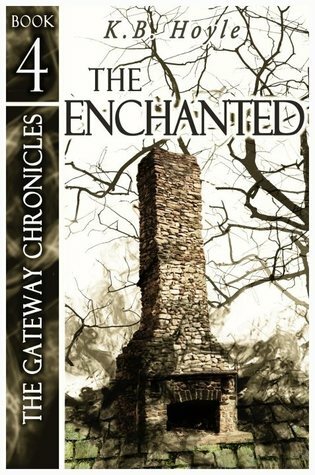 The Enchanted is a great read and I am gad that the series keeps getting better and better. Bring on the next book I say! In the fourth book for the Gateway Series, things are complicated before they even make it through the gate. Amelia brings her boyfriend Simon to camp this summer. They have been together for two years and she feels she can tell him about Alitheia. Darcy and the others think it is a mistake, but can’t talk her out of it. He, of course, thinks she is crazy and dumps her. She is heart broken as she goes through the gateway. Sam and Lewis are now dating as well as remain best friends. They are happy to be back and are excited to go back to Alitheia. Perry and Dean are excited to go back also. They learn their lesson from last year and go through the gate at exactly the time they are supposed to. Darcy is nervous to see Tellius. After her feelings for Perry last summer came out, things with Tellius became awkward. She is not sure what to expect. Tellius has grown and become the young man that Darcy comes to have strong feelings for this visit. But tragedy strikes twice and Darcy is pushed aside. The six struggle with what they have lost and find that Colin has made a pact with Tselloch. He becomes more of a threat to the six and Alitheia. Tselloch wants Darcy and will try anything to get her. Darcy learns more about the message she received from her visit to the Oracle. She is confronted with nightmares and more worries about her friends and herself. Tselloch tries multiple times to get to her and even Tellius. The six, along with Rubidius, embark on a voyage to find out more about Tselloch’s gates, even the one he is trying to open in their world with Colin’s help. The book had a lot of heartbreak in it. It made me tear up as I read it and I felt for Darcy. She tries so hard to do the right thing and be the leader for her friends. She even tries to do her best being the intended to Tellius. She is growing up right before the readers’ eyes. This story had battles, betrayals, emotional anguish and love all rolled into one storyline. I couldn’t put it down. I read it in one day. I give it 5 out of 5. This book… wow… I don’t even know what to say! I started reading this series when the first book came back… and well, at that time is was not my favorite because everyone was just so young (only 13). But now, they are all so much older, and although I caught glimpses of everyone's growth and maturity, this book just blew it out of the water! Darcy is so fantastic now! She is still very stubborn, and a little spontaneous, but she has matured so much and is by far my favorite character in this whole This book… wow… I don’t even know what to say! Darcy is so fantastic now! She is still very stubborn, and a little spontaneous, but she has matured so much and is by far my favorite character in this whole series! In the first book, she was a loner, and she liked it that way… now into the forth book, and being 16 she has really discovered who she really is. Also she is wayyy past the whole Perry Crush which I was SUPER happy about! I have never really been a fan of Perry, he is just very egotistical and jockish. But Tellius… oh boy… has he ever grown! He is fully aware of who he is and what he wants, and OMG he went through such heartache in this book I literally cried for him multiple times in this book! No matter what though he is totally the perfect match for Darcy, and what the oracle said to Darcy is really starting to scare me, I do not want to lose Tellius! We are starting to learn a bit more about the six, Darcy, Sam, Dean, Perry, Amelia, Lewis… but I am hoping for more to come out about Dean, he is still a mystery to me, he is always just there… never in the front, very solid and yea just THERE… it just feels like I need to know more about him! This book had me bawling like a baby… laughing like a hyena… experiencing loss as well as love… There was not a single thing I would have changed! Received as an ARC via net galley, part of the blog tour. In The Enchanted and The Scroll the saga of The Six continues. Darcy's worry I loved this series so hard. I am seriously suffering withdrawals and I am morose now. Nothing I'm looking to read next can compare. K.B. has drawn me so far into the world of Darcy and friends that I must know how this story ends and I just feel tortured with pure impatience. K.B. if you read this, please - send me anything you've written to date on book six. I don't care if it's rough and unedited. I'm in pain! Please? OK, so why not a 5 star like the previous book in the series? Is it a good book? Absolutely! Did I love it? In parts, but not the whole, so I can't go 5 stars. The setup for the romance has been there since the beginning, so I had to know it was coming. That doesn't mean I had to like it. As far as the romancy stuff goes, it's well done and actually had me "hooked" or at least interested in parts, but I'm not the intended audience. The exciting parts of the book are very much exciting, so it make OK, so why not a 5 star like the previous book in the series? Is it a good book? Absolutely! Did I love it? In parts, but not the whole, so I can't go 5 stars. The setup for the romance has been there since the beginning, so I had to know it was coming. That doesn't mean I had to like it. As far as the romancy stuff goes, it's well done and actually had me "hooked" or at least interested in parts, but I'm not the intended audience. The exciting parts of the book are very much exciting, so it makes up for this being a romance heavy book. Also, even through the romance parts, Hoyle does a great job of character interaction and dialog. She is so superior to many other authors in this area (i.e. Rick Riordan, which is the other book series I'm reading through right now. I like those OK.). Amazing story progression! Darcy and Tellius are so close to becoming a couple, then Tellius has to ruin it! Ugh! I was so upset at him :( This book was so fast paced, I was halfway through before I knew it. I tried to slow down my reading to draw it out more, but I was so anxious to see what happened next that I couldn't do it. Darcy and Tellius have both grown up so much since the first book. Perry is becomming a little annoying. Sam and Lewis were interesting, even though I didn't think they Amazing story progression! Darcy and Tellius are so close to becoming a couple, then Tellius has to ruin it! Ugh! I was so upset at him :( This book was so fast paced, I was halfway through before I knew it. I tried to slow down my reading to draw it out more, but I was so anxious to see what happened next that I couldn't do it. Darcy and Tellius have both grown up so much since the first book. Perry is becomming a little annoying. Sam and Lewis were interesting, even though I didn't think they made a good couple. We didn't see or hear that much about Dean and Amelia didn't seem to change from the last book. This is a series that I will re-read from the beginning when book 6 comes out. I just hope I don't have to wait for a very long time! Book four finds a more mature 6 on their way back to Alitheia. “Enchantments are powerful—the most powerful magic we have,” Rubidius (the foremost wizard of Alitheia) said. “They can change the nature and composition of animate and inanimate things alike, and they can foil the plans of the most determined foes. The SIX are hoping to destroy the Gateways between worlds as a means of stopping Tellius the leader of the dark forces. A wonderful continuation is a series that is growing nearer to my heart with every page. It was a very emotional book compared to the other books and I found myself in despair and sitting on the edge of my seat as I wait to see what happens to these characters. I can see the development of character much as one sees Harry Potter or Katniss Evergeen or the Pevensie Family develop as their own series Looking forward to cracking open the next book The Scroll. Whole series is great. I've read them all multiple times and am about to start them again in anticipation of book 5. Absolutely loved this book!! Can't wait for the next one. This is possibly my favorite of the Gateway Chronicles. It's wonderful! I've read it twice and it won't be the last time. The action just keeps ratcheting up! Great story. She was a panel speaker at the 2013 Sydney Writer's Festival in Sydney, Australia, and a featured speaker at the Great American Book Festival in 2017. Her books receive high acclaim from readers and reviewers wo K. B. Hoyle is a multiple award-winning Young Adult author, a public speaker, and a creative writing instructor. She is represented by Ben Grange of the L. Perkins Agency in New York City. She was a panel speaker at the 2013 Sydney Writer's Festival in Sydney, Australia, and a featured speaker at the Great American Book Festival in 2017. Her books receive high acclaim from readers and reviewers worldwide. “Most boys her age spent half their free time playing video games, but Tellius spent all of his in adult pursuits like fighting, managing, ruling, and delegating, and it showed. If she’d begun to think he was attractive last year, she now wondered how she ever could have found him anything but attractive. As she took in his square jaw, straight aristocratic nose, intense green-flecked eyes, and that ever-present smattering of freckles, Darcy felt her ears grow warm. She looked down at the flagstones.